Treating certain conditions associated with decreased adrenal gland function. It is also used to treat severe inflammation caused by certain conditions, including severe asthma, severe allergies, rheumatoid arthritis, ulcerative colitis, certain blood disorders, lupus, multiple sclerosis, and certain eye and skin conditions. It may also be used for other conditions as determined by your doctor. 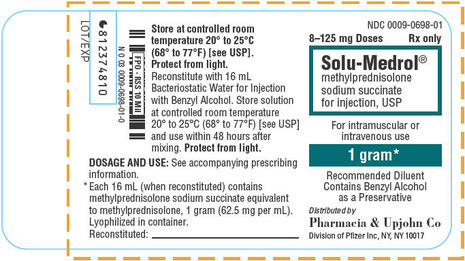 Solu-Medrol Solution is a corticosteroid. It works by modifying the body's immune response to various conditions and decreasing inflammation. Solu-Medrol, a corticosteroid, to relieve inflammation (swelling, heat, redness, and pain). The drug will be added to an intravenous fluid that will drip through a needle or catheter placed in your vein for at least 1 hour per day. Solu-Medrol is similar to a natural hormone produced by your adrenal glands. It is used to treat, but not cure, certain forms of arthritis; skin, blood, kidney, eye, thyroid, and intestinal disorders (e.g., colitis); and multiple sclerosis. This medication is sometimes prescribed for other uses; ask your doctor or pharmacist for more information. Your health care provider (doctor, nurse, or pharmacist) may measure the effectiveness and side effects of your treatment using laboratory tests and physical examinations. It is important to keep all appointments with your doctor and the laboratory. The length of treatment depends on how you respond to the medication. Solu-Medrol is one brand name for the generic medication methylprednisolone sodium succinate. It is a member of the glucocorticoids, similar to the naturally occurring steroid hormone cortisol, and is known for its anti-inflammatory properties. 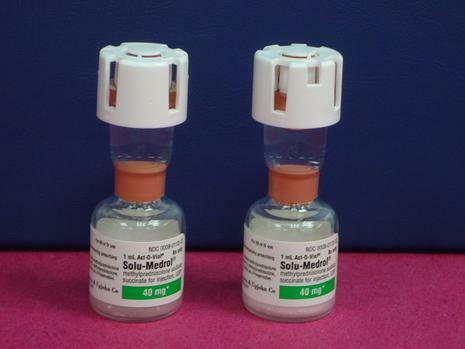 Solu-Medrol is available as an injectable solution for intravenous and intramuscular injection and is also available in another brand name, A-Methapred. Methyprednisolone is a synthetic analog of a physiologic hormone cortisol and works by substituting for cortisol in physiologic processes. It acts by inhibiting leukocyte infiltration at and inflammation site and interfering with other mediators of inflammatory response such as leukotrienes and prostaglandins causing a decreased immune response to inflammation of any type.